PHOENIX Petroleum was named Outstanding Filipino Franchise in Retail-Large Store Category in the 2017 Franchise Excellence Awards (FEA), the second time for the company to receive the prestigious award, at the SMX Convention Center, SM Mall of Asia, Pasay City on July 19, 2017. FEA is the most distinguished award in the franchising sector given to best-managed companies that are benchmarks for all fran- chising businesses. It is organized by the Philippine Franchise Association and the Department of Trade and Industry in cooperation with the Philippine Retailers Association and the Philippine Chamber of Commerce and Industry. *THIS ARTICLE WAS PUBLISHED IN THE MANILA TIMES, AUGUST 7, 2017, B7. The quick service restaurant favorite won the Outstanding Filipino Franchise and the Best Overall Marketing Campaign Award last July 20 at the SMX Convention Center. Mang Inasal, widely known for Pinoy-style “nuot sarap” grilled chicken and other quality popular Filipino dishes, has once again proven why they deserve the honor of being the top grilled Pinoy branded outlet in the country after winning the Outstanding Filipino Franchise, as well as the Best Overall Marketing Campaign Award at the 2017 Franchise Excellence Award (FEA). 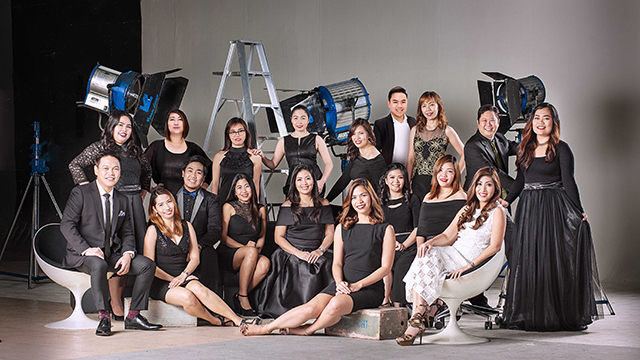 Considered the “Oscars” of the franchising sector, the FEA is the country’s first and only industry award that recognizes top home grown and international franchisors in the Philippines. FEA celebrates the country’s best-managed companies that serve as benchmarks for franchising businesses. This year’s ceremonies were held on July 20, 2017 at the SMX Convention Center in Manila. 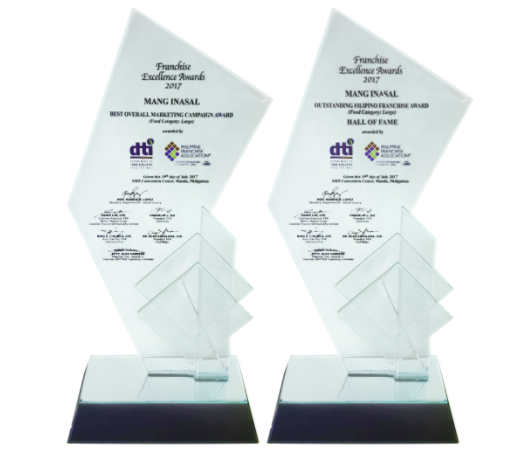 The Outstanding Filipino Franchise Award is an honor bestowed to franchises that have become standards in national market penetration through excellent franchise operations and corporate governance. The award, which Mang Inasal won for the Large Food Category, places Mang Inasal in rarified circles, as it has won it in consecutive fashion, elevating the company into FEA’s prestigious Hall of Fame. The win was largely keyed by Mang Inasal’s launching of the Franchisory Advisory Council and other relevant initiatives, resulting in substantial net profit growth. The award for Best Overall Marketing Campaign in the Large Scale Business for Food Category is given to companies with successful and effective marketing programs that significantly contribute to company growth and the advancement of the franchising sector. Mang Inasal strengthened brand communications through effective marketing campaigns, which resulted in impressive growth for flagship products. Brand love initiatives further raised the company’s profile and reached more customers by reinforcing its position as the QSR (quick service restaurant) that truly understands unique Pinoy dining quirks, as seen in its successful Sarap ng Kaing Pinoy campaign. According to Kantar Worldpanel, a global expert in monitoring and analyzing shopping behavior, Mang Inasal is the top grilled Pinoy branded eat-out in the Philippines. Kantar Eat Out Panel is a continuous panel of individuals from Metro Manila, looking at consumer eating out purchase behavior. Mang Inasal, a subsidiary of Jollibee Foods Corporation, is the leading Pinoy branded outlet in the cf its gountry, with its strong portfolio of Chicken Inasal, Pork BBQ, Halo Halo, and Palabok. Variations in the menu are constantly being developed to meet the discriminating demands orowing customer base.